Civil rights advocate and entertainment attorney James Lionel Tolbert was born in New Orleans, Louisiana on October 26, 1926 to Albert Tolbert and Alice Young Tolbert. His father was a chauffeur and his mother came from a prominent musical family. One of his uncles was noted tenor saxophonist Lester Young. Tolbert was sent at age 10 with his older sister and brother to Los Angeles, California, to receive musical training from their grandfather, Willis Young, a leading jazz educator who schooled him on the trumpet. Tolbert dropped out of high school and served in the United States Army from 1945 to 1947. Returning home from the service, he earned a high school equivalency degree and received a bachelor’s degree in journalism from Los Angeles State College of Applied Arts and Sciences (later California State University at Los Angeles) in 1955. Four years later, he graduated from Van Norman Law School in Los Angeles. Tolbert established the law firm of Tolbert and Wooden (later Tolbert, Wooden, and Malone) in 1960. 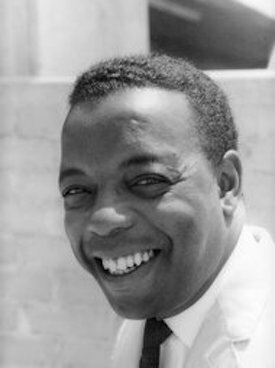 In 1962, he co-founded and became president of the Beverly Hills-Hollywood branch of the National Association for the Advancement of Colored People (NAACP). The branch was specifically established to address the problem of racial discrimination in the Hollywood film and television industries. In the summer of 1963, Tolbert and other NAACP officials promised to picket theaters, hold demonstrations, and boycott major advertisers if film and television studios did not portray more African Americans in diverse roles. By 1965, black actors and actresses held over 80 roles in 35 movies and appeared on television in 140 parts. Tolbert also pressured all-white craft unions to hire one African American worker for every movie and television show set in Los Angeles. His campaign led to some union hiring of black technicians in the entertainment industry. In May of 1964, civil rights attorney Loren Miller, owner and editor of the California Eagle, the oldest African American newspaper in the western United States, was appointed to the Los Angeles County Municipal Court. Tolbert took over the California Eagle and served briefly as co-owner and publisher. During the 1970s, Tolbert’s law firm represented several African American celebrities. Among them were comedian and actor Redd Foxx, actress and singer Della Reese, and trumpeter Harry “Sweets” Edison. Community service was another part of Tolbert’s career. From 1988 to 1990, he headed the San Fernando Valley Arts Council. He also served on the Los Angeles County Transportation Commission and the Southern California Rapid Transit District Board in the early 1990s. The NAACP honored Tolbert with its Special Tribute Award at the association’s Image Awards ceremony in 2000. James Lionel Tolbert died in Santa Monica, California, on April 22, 2013, at the age of 86. He was survived by his wife, Maria, a son, two daughters, two sisters, and two grandchildren. Sentinel New Service, “James L. Tolbert Succumbs,” May 10, 2013, http://lasentinel.net/index.php?option=com_content&view=article&id=11113; Valerie J. Nelson, “James Tolbert, 1926-2013. He pressed Hollywood on civil rights,” Los Angeles Times, May 12, 2013; William Yardley, “James L. Tolbert, 86, an Early Lawyer to Black Hollywood, Dies,” New York Times, May 25, 2013. Black Hollywood, Dies,” New York Times, May 25, 2013.